Forecasts for triple-digit heat have caused a minor panic across the Pacific Northwest, a region famous for cool weather where many people do not have air conditioning to help them endure the rare furnace-like blast. In normally temperate Oregon and Washington, families generally get by on warm days by simply drawing shades and running fans. But a searing high-pressure system is expected to make Portland and Seattle hotter than Phoenix, at least for a couple of days. Many concerned communities have opened cooling centers and warned residents to stay hydrated, avoid strenuous activity and keep their dogs out of parked vehicles. The National Weather Service slightly dialed back its forecast for Portland to match or break its record high of 107 degrees (41.7 Celsius). Meteorologist David Bishop said the city is now looking at 104 (40 degrees Celsius) or 105 degrees (40.5 Celsius) on Wednesday and Thursday. The latest forecast for Seattle also showed predicted highs easing a bit from earlier predictions. The weather service said the high for Wednesday would be 91 degrees (32.8 Celsius) and 94 (34.4 Celsius) on Thursday. The Northwest is better known for its fall, winter and spring rainy seasons. Even July and August are relatively mild months. But the powerful high-pressure system arrived just at the height of summer. Portland’s light-rail trains are operating at slower speeds amid concern that the heat will cause tracks to expand and risk a derailment. In exchange for the slow service, fare inspectors are not checking riders for tickets. Hun Taing uses the train to get to her job in downtown Portland, but she switched to an air-conditioned car because of the delays. She and a co-worker, Heather Heater, had a casual work meeting Wednesday at Director Park, dipping their toes in the fountain as children splashed in the water. They both have air conditioning at home – something they once lacked – and expressed more concern for the homeless and elderly than for their personal comfort. Heater, who endures jokes about her last name, said having air conditioning was a requirement when she moved to the fourth floor in a recently constructed apartment building. Anna Miller, 27, lives in an older brick building – a situation faced by many young renters in Portland. “It’s going to be pretty warm, but I’ll probably just go to a bar before going home,” said Miller, who wore a scarf and long sleeves outdoors Wednesday because the morning was chilly and she works in an air-conditioned office as an administrative assistant. Forecasters had warned that Seattle could see its highest temperatures since the 1890s. The city has recorded only three days at 100 degrees (38 degrees Celsius) or higher in the more than a century, according to the weather service. The Pacific Northwest’s largest city opened about 30 cooling centers in air-conditioned libraries and senior centers. 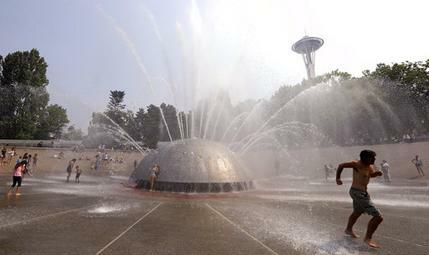 Seattle officials also encouraged people to use more than two dozen wading pools and spray parks. Outside an Amazon warehouse in Kent, Washington, hundreds of people lined up in a hot parking lot for a job fair, waiting to enter an air conditioned tent to check in. One potential applicant left after being told he couldn’t leave his dog in his car, even with the windows open. Ron Joslin, 55, of Tacoma, broiled in a lavender shirt and striped tie as he waited. He’s been out of work since April, but the forecast almost kept him from the job fair, he said. His wife insisted he go. Amazon took lengths to keep the potential employees comfortable, handing out iced bottles of water. Some temporary workers hired for the day ferried trays of cups overflowing with blue, red and yellow shaved ice to the sweltering applicants from a truck playing steel-drum music. In the state capital of Olympia, 66-year-old Dave Thysell was two-thirds of the way through a 13-mile walk, a trek he said he made earlier than he usually does. Temperatures in the capital were supposed to be in the upper 90s Wednesday and surpassing the 100-degree mark on Thursday. In spite of the scorching conditions, Thysell said he’s not rushing out to buy an air conditioner. Even if he wanted to, most stores are sold out. Associated Press writers Gene Johnson in Seattle and Rachel La Corte in Olympia, Washington, contributed to this report.